One of my dream jobs would be to be a professional wrapper - you know the people that get to wrap up parcels all day in pretty paper and tie satin ribbons around them to make them gorgeous ... ok maybe after the 1,000th parcel I might have had enough ... but I love to wrap things up and the presentation of a gift (to me) is half the joy. Each cuddly little softie from Rachael Rabbit is sent to its new home in a little cotton sleep sack (gift bag) and the cotton bags really do add a little something extra. 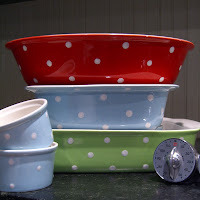 I've also been made rather happy by dots recently - on a search to find a pretty baking dish to make cobblers in etc - I found these gorgeous dishes from Spode's Baking Days line. Every time I look at them in my kitchen I am inspired to bake something yummy and wholesome. 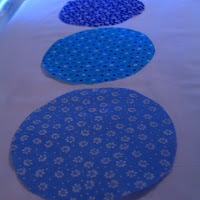 So it is now officially spring (we don't have any daffodils in bloom yet) and I've been inspired by dots or spots ... 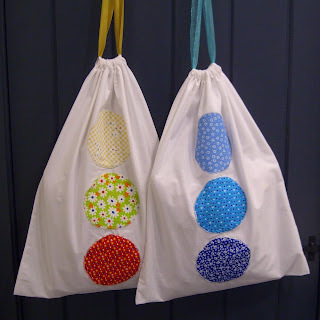 I made some Spotty Spring Drawstring Bags! These simple drawstring bags have so many uses - I use them for storage or yarns/craft items, protecting shoes and handbags, packing small items for holidays, laundry and as gift bags. (Time: 30mins to 1hr) Finished Bag measures 21"l x 16"w.
Make casing for ribbon: In all 4 corners along long side of fabric fold 1/4" in and then fold 1/4" in again - press and sew for 2.5". Along short edge fold 1/2" in and then fold 1" in again - press and sew across entire length of short edge. Finish Bag: Fold fabric with spots facing in and sew down each side of bag. 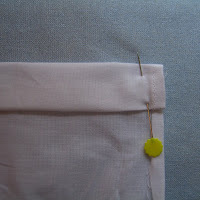 (Once the seam is sewn I also like to use a binding stitch to prevent fraying.) Turn bag right-side out and press. 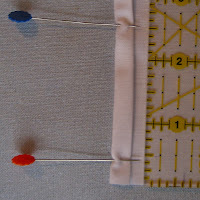 Thread Ribbon: Use a safety pin or sturdy needle to thread ribbon through casing. Once threaded tie ribbon in tight knot at each side. Lovely tutorial. I like the appliqued dots. Nice work! Oh my those dishes are gorgeous. Thank you for your advice re: my patchwork, I shall definitely start carrying bits around with me! Great tutorial and I love your bags!! thanks fr the tutorials.. I'm our new follower now. 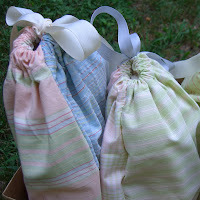 I found this really useful to make pyjama bags for my sisters for there bdays. they turned out really cute!